In part I of this article, I discussed that optimal alignment of the scapula is in upward rotation and posterior tilt and that the forward shoulder posture is characterized by downward rotation and anterior tilt of the scapula. If starting alignment is not improved, an over-reliance of scapular retraction exercises will frequently perpetuate scapular positioning in downward rotation and anterior tilt. In part II of this article series, I expanded that discussion and demonstrated how to integrate optimal shoulder alignment and control into pulling patterns to improve both static positioning and, more importantly, dynamic function in your clients having a forward shoulder posture. With those articles as background, I can now discuss how to integrate optimal shoulder mechanics into common pushing exercises so that your client’s functional exercise patterns reinforce rather than detract from optimal function. Develop improved stability and function of the shoulder complex in individuals with the forward shoulder posture. To briefly review information from the previous two articles, the scapula should be relatively stable upon the thorax and positioned in slight upward rotation and posterior tilt. More importantly, the scapula should further upwardly rotate and posteriorly tilt during forward and overhead motions of the arm. The scapulae should be controlled during the eccentric phases of motion so that the scapulae do not ‘wing’ (anterior tilt of the scapula where the inferior angle of the scapula lifts off the thorax) or ‘flare’ (the medial border of the scapula lifts off the thorax). Winging or flaring of the scapula is a motor control issues and should not be mistaken as a weakness of either the serratus anterior or scapular retractors. Therefore, strengthening the serratus anterior, rhomboids and/or middle trapezius will merely reinforce non-optimal function, if scapular alignment and control is not first improved. Improving alignment and control of the scapula was discussed in the previous two articles. Pushing patterns are characterized as either horizontal—where the arms are moving perpendicular to the body (horizontal referring to the individual positioned in standing and pushing band, cable or sled resistance)—or vertical—where resistance is being pushed or pressed overhead. Optimal mechanics of the scapula and shoulder complex will be discussed using the band or cable press and the overhead press as respective examples of horizontal and vertical pushing patterns. Recall from Part I that the scapula should ideally rest upon the thorax in slight upward rotation (where the inferior angle of the scapula is slightly more lateral or further away from midline as compared to the superior angle) and posterior tilt—a position where the inferior and anterior surfaces of the scapula gently hug the posterior aspect of the rib cage (Sahrmann 2002, Osar 2016). Although this alignment will vary slightly depending upon the activity and direction of force, ideally the scapula should remain in relative upward rotation and posterior tilt during most exercise patterns (Osar 2016, Osar 2012). As discussed in the previous articles, in individuals with chronic shoulder and/or neck issues, there tends to be a dominance of the muscles that downwardly rotate (levator scapula and rhomboids) and anteriorly tilt (pectoralis minor) the scapula. In these individuals, the lower fibers of pectoralis major and latissimus dorsi will additionally contribute to this non-optimal positioning and subsequent altered control during functional movement patterns and activities of daily living. Theses muscles will often need to be released prior to retraining more optimal control of the shoulder complex. Additionally, the posterior deltoid and teres minor and major are often found to be over-active in the forward shoulder posture and require release prior to retraining. These latter muscles limit glenohumeral dissociation and significantly contribute to scapulo-thoracic control issues. As the arms are brought forward through the concentric phase of a horizontal pushing type motion, the scapula should abduct and ‘wrap’ around the thorax. The term ‘wrap’ implies that the scapulae remain controlled against the thorax in slight upward rotation and posterior tilt. As the arms move back through the eccentric phase of the motion, the scapulae adduct and they are brought back to their original resting position. See images below. During the concentric phase of a pushing pattern the scapula should ‘wrap’ (abduct) around the thorax (image above left). During the eccentric phase, the scapula should adduct back to their original resting position (image above right). The scapula should remain in upward rotation and posterior tilt throughout the pattern. Notice the scapulae abducting around the thorax during the concentric phase of the horizontal band or cable push pattern (above image left). During the eccentric phase of the pattern, the scapulae adduct back to their starting neutral position and remain in slight upward rotation and posterior tilt (image above right). In individuals with the forward shoulder position, it is common to not control the eccentric phase of pushing patterns. With poor eccentric control, the elbow moves behind the shoulder which drives the humeral head forward and causes over-adduction of the scapula (image above left). When re-training motor control, it is often beneficial to cue the individual to think about bending their elbows while maintaining their scapula in the ‘wrapped’ position and keeping the elbow in front of the shoulder (image above right). This cue helps decelerate the rate at which the scapula adducts during the eccentric phase of the pattern. During a push up pattern, the scapula should move exactly in the same manner as discussed above. In other words, the scapula should adduct during the eccentric phase and abduct during the concentric phase of the pattern. Note the scapular position in my niece while in the plank position (image far left). The scapula should never come into downward rotation or anterior tilt during the push up pattern as it does in my client with chronic shoulder issues (image near left). Again, it is important to point out that this client’s issue is a motor control and not a strength issue. 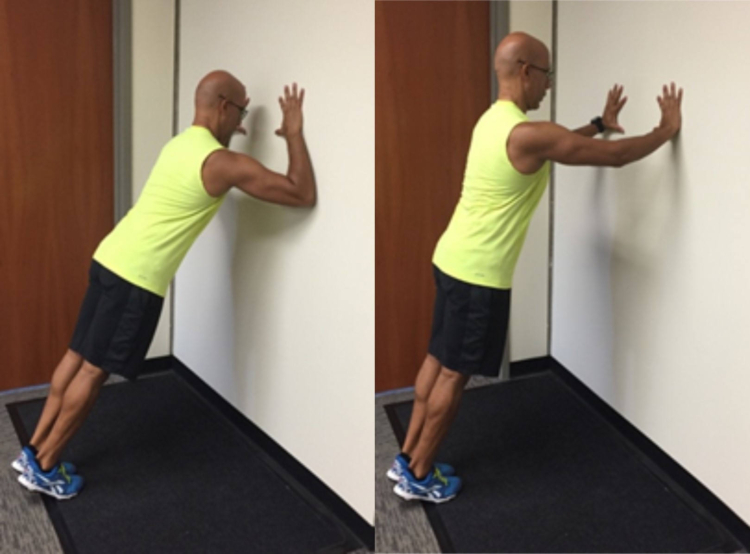 I created The Modified Wall Plank with Elbow Extension for our patients with the forward shoulder position and scapular control issues. We have found that this pattern is the easiest way to retrain optimal alignment and control of scapular mechanics during pushing patterns. The position of the hands and forearms against the wall biases upward rotation and posterior tilt of the scapula (see images to right). The individual is cued to be ‘long’ through the back of their spine and feel as if they are lightly pulling the wall apart between their hands as they push away from the wall. They perform two sets of 10 reps as part of their activation strategy. Once the individual understands how to control this position of the shoulder complex they are progressed to a Wall Push Up then an Elevated Push Up and then finally to the floor Push Up pattern. They should be able to align and control the thorax and scapula in whichever version of the pattern they are performing. 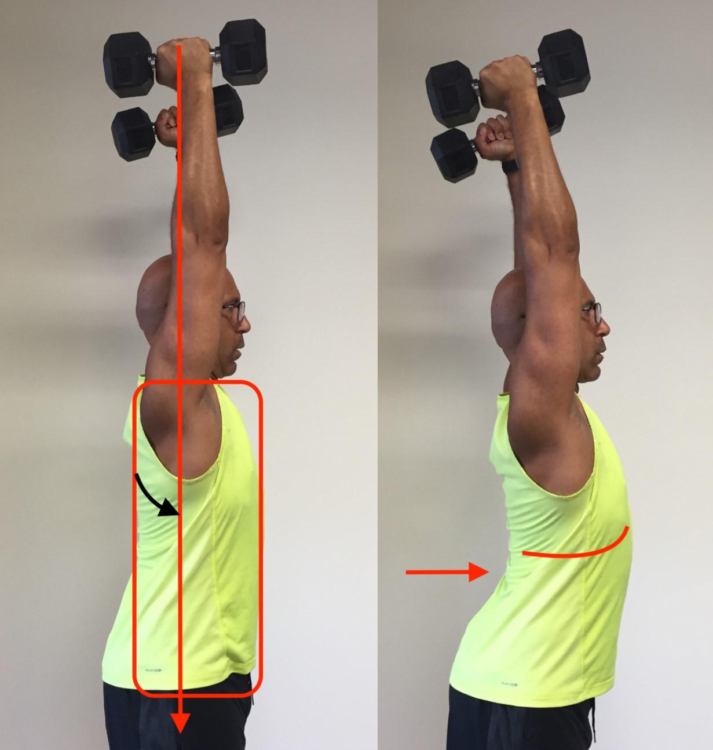 During a vertical pushing pattern, such as an overhead press, the scapula should wrap around the thorax and move into further upward rotation and posterior tilt through the concentric phase of the pattern. During the eccentric phase of the pattern, the scapulae move back to their initial resting position of the shoulder complex (i.e. back to the beginning neutral posture). The scapula should not be allowed to come into excessive depression, adduction and/or downward rotation. As the arm moves overhead through the eccentric phase of a vertical pulling pattern, the scapula should move further into upward rotation (image far left) and posterior tilt (image near left). Tightness in the scapular downward rotators (levator scapula and rhomboids) and anterior tilters (pectoralis minor) as well as the depressors (latissimus dorsi and lower fibers of pectoralis major) can inhibit optimal overhead motion leading to compensations during overhead motion. Also note how the individual is able to maintain optimal alignment of her thoracopelvic cylinder as she raises her arms. It is important to ensure that the individual lacking the prerequisite range of shoulder flexion does not compensate and hyperextend at the thoracolumbar junction to get their arm into a fully vertical or overhead positon. As with the horizontal pushing pattern, the scapula should return to the starting, neutral position versus being overly adducted during the eccentric phase of vertical pushing patterns. During the concentric phase of vertical or overhead pushing patterns, the scapula wraps around the thorax and should be controlled in upward rotation and posterior tilt (black arrow in image near right). During the eccentric phase, the scapula adducts back to the resting position of the scapula yet remains in upward rotation and posterior tilt. Be sure to watch for thoracolumbar hyperextension and anterior rib cage flaring in clients who lack shoulder range of motion and/or are using weight that is too heavy relative to their core stability (image far right). When horizontal and vertical pushing patterns are performed in the manner described above, the individual is training all their scapular muscles to synergistically work in maintaining the scapulae in upward rotation and posterior tilt. In other words, our client’s movement patterns are reinforcing optimal scapular alignment and mechanics and are not forcing the individual to adopt a non-optimal alignment or control strategy. As was discussed with pulling patterns, if an individual has optimal scapular alignment and control, training through a full range of protraction and retraction is not a problem during pushing patterns. However, when the individual is struggling with alignment and control of their scapula and their current strategy is manifesting in chronic neck, shoulder and/or upper thoracic dysfunction, the over-riding goal is to initially teach them where neutral alignment is and how to control their scapula during all their functional movement patterns. Once they develop and demonstrate a more optimal strategy, they can be strategically trained utilizing full shoulder retraction and protraction. In this three-part article, we have discussed how all the muscles of the shoulder complex work synergistically to maintain the scapula in slight upward rotation and posterior tilt during both static posture and dynamic movement. The serratus anterior, upper and lower trapezius upwardly rotate and posteriorly tilt the scapula while the levator scapula, rhomboids, and pectoralis minor will downwardly rotate and anteriorly tilt the scapula. Upward rotation and posterior tilt of the scapula should be relatively maintained during both static posture and during dynamic activities whether the individual is performing pushing or pulling motions. The scapula should move further into upward rotation and posterior tilt as the arms moves forward and/or overhead and return to the starting neutral alignment as the arms are brought back to towards the body. The forward shoulder posture occurs when there is a dominance of the downward rotators and anterior tilters of the scapula. This non-optimal alignment strategy is perpetuated during many movement patterns especially when the individual is cued to overly use their scapula retractors during the concentric phase of pulling patterns or not control the eccentric phase of pushing patterns. This over-activity and/or loss of control reinforces non-optimal posture and is perpetuated by the non-optimal movement strategy. Over-dominance of the scapular retractors becomes a problem for many individuals because it disrupts optimal shoulder mechanics especially during initiation of overhead motion and during the eccentric phase of shoulder motions. The principles of the Integrative Movement System—alignment, breathing and control—provide a framework for restoring optimal alignment and control of the thoracopelvic cylinder and the scapula in relationship to the thorax. The individual must align their thoracopelvic cylinder and control their scapula relative to their thorax during all patterns. Only when the individual demonstrates optimal alignment and control of the thorax and shoulder complex, should they be encouraged to perform full protraction and retraction of the shoulder complex during their pushing or pulling patterns. When you help your patient or client develop and reinforce optimal alignment and control through their functional movement patterns, you are providing them with a strategy for successfully achieving their health and fitness goals while decreasing the likelihood for developing and/or perpetuating their habitual compensations. That’s how you become the solution that your clients need, want and will seek out. As a chiropractic physician, Dr. Evan Osar provides a unique perspective on corrective exercise and fundamental training principles for the health and fitness professional that works with the pre and post-rehabilitation, pre and post-natal, baby boomer and senior populations. Dr. Osar has become known for taking challenging information and putting it into useable information the health and fitness professional can apply immediately with their clientele. He is the creator of over a dozen resources including the highly acclaimed Corrective Exercise Approach to Common Hip and Shoulder Dysfunction and has co-authored the recently released Functional Anatomy of the Pilates Core. He created the Integrative Corrective Exercise Instructor™ and Integrative Movement Specialist™ certifications to help health and fitness that work with the general population discover real-world strategies and solutions for improving posture and movement. For more information, please visit The Institute for Integrative Health and Fitness Education at www.IIHFE.com. Osar, E. 2016. The Integrative Movement Specialist Certification. Module III: Shoulder and Upper Extremity. Chicago Integrative Movement Specialists – course handouts. Chicago, IL. Osar, E. 2012. Correction Exercise Solutions for Common Hip and Shoulder Dysfunction. Lotus Publishing; Chinchester, UK. Sahrmann, S. 2002. Diagnosis and Treatment of Movement Impairment Syndromes. Mosby; St. Louis, MO.